Most of you are already on your way out of town for the weekend. I love to drive in general, but I especially enjoy it if I’m going on a trip. Sometimes when I’m driving to work I want to just keep driving until I run out of gas to see where I’d end up. What kind of snacks do you eat? Where do you like to stop for food? I have driven all over this country and the best places to stop for good food are off the beaten track. One time a few years ago I was driving through rural [Midwestern state] and I saw a sign for apples or tomatoes and I followed a small road to a large farm. There was a greenhouse to one side with tons of fresh fruit and preserves and I just started loading up. Behind a makeshift counter and cash register stood a young Amish/Mennonite girl looking like she wanted to be anywhere but the hot greenhouse with bees buzzing all over. She was bored and barely cracked a smile. Poor thing wanted to get out of there, which is understandable, but seemed funny to me considering what riches surrounded her. What I bought that day was delicious and I had to go a little farther to get it. Instead of driving on a freeway or a tollway and taking an exit with options like the golden arches, I chose a smaller, scenic highway with access to local “flavor.” Journeys are metaphors for many things in life including food: Sometimes you have to go out of your way for quality. Talk about the ultimate road trip! I know that many schools are done or almost done. Just so you know, I still have a couple more weeks. When I’m done with the school year, I’m going to need a stiff drink. Who wants to take me out for a shot or two? I’m not much of a drinker, but I may have to make an exception. The pasta tasted good, but I took a closer look at the meat and now I’m not feeling as supportive of this dish. I assumed it was regular ground beef, but there were little chunks in there that appeared almost chopped. Take a closer look at the photos and tell me what you think. Taking an informal poll, most of the kids don’t like the pasta. That bums me out because it is closer to actual food in comparison to other processed food items. 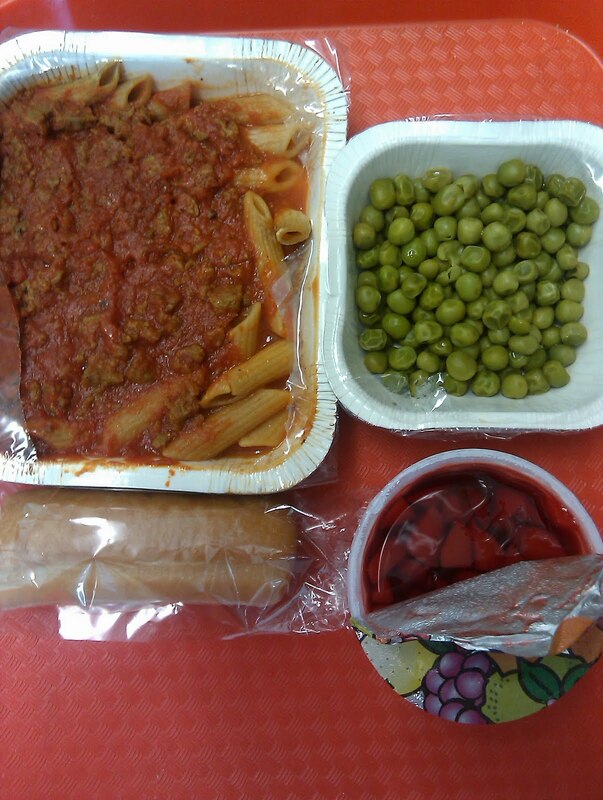 I ate the peas, breadstick and fruit jello. I clean my tray these days. Jamie Oliver talked about getting his Titanium Spork Award in his latest Food Revolution video released this afternoon!! I was so excited to see my spork made it across the Atlantic and into his hands. I wrote him a little note too, but now I forgot what it said. I’m happy that you guys voted for Jamie because I think he is a great advocate for children, their food, and their health. How many people do you know putting their reputation on the line for kids’ health? Aside from an open thread for tomorrow, I’m taking a vacation. On Memorial Day I’ll be thinking about the sacrifices made by American men and women, including my family and friends. Regular posting will resume on Tuesday (although I will be tweeting a little over the weekend). There will be more school lunches to eat next week! I hope you had fun skipping today. I skipped AND tap danced. So there. I really need this vacation to make it that final push forward to finish the school year. The blinding blue chicken nugget glare is from florescent light and outside light coming in and hitting the leftover bit of plastic on the container. It’s like they just got blessed by a higher power. Let’s hope so for my sake. Guess what? I drank the juice from the fruit cup and left the fruit. I just wanted to. The nuggets were consumed with copious amounts bbq sauce. The carrots were warm, almost hot and it felt terrific to feel them slip down my throat. Hot food is so comforting to me. And I dove into my personal stash of peanut butter and slathered up both slices of bread. Peanut butter on bread reminds me of my childhood….yum. Just so it’s perfectly clear: I could go the rest of my life without eating another chicken nugget. 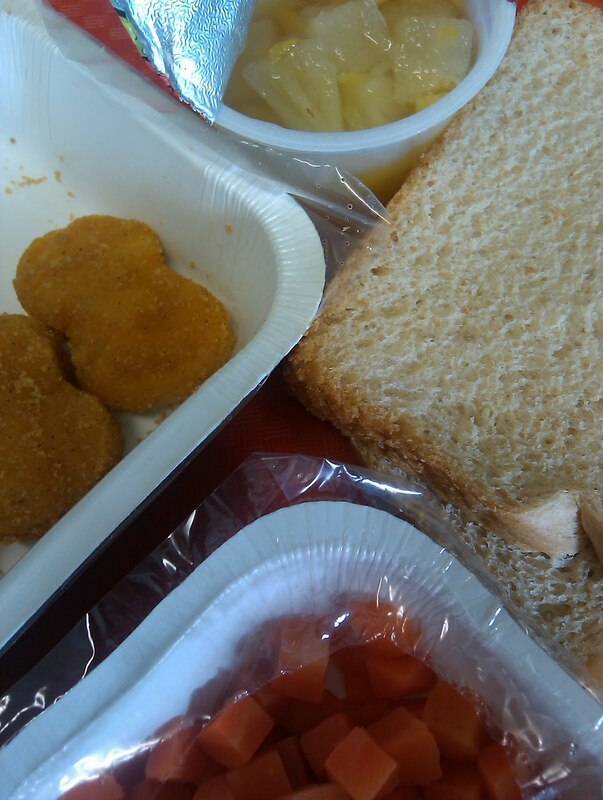 This is the tenth chicken nugget meal I’ve eaten (that number does not include the chicken patties I’ve also consumed). I have ingested more chicken nuggets over the past five months than I have in my entire life. I’ve probably had chicken nuggets twice in the past 10 years. In fact, I never eat fast food (no Mc*Donalds, no Wendy’s, no Taco Bell, etc). I’m not saying I always eat healthy, but when we choose a “faster” food option, we go with sub shops, local diners and greasy spoons, or ethnic restaurants (Asian, Mexican, etc). 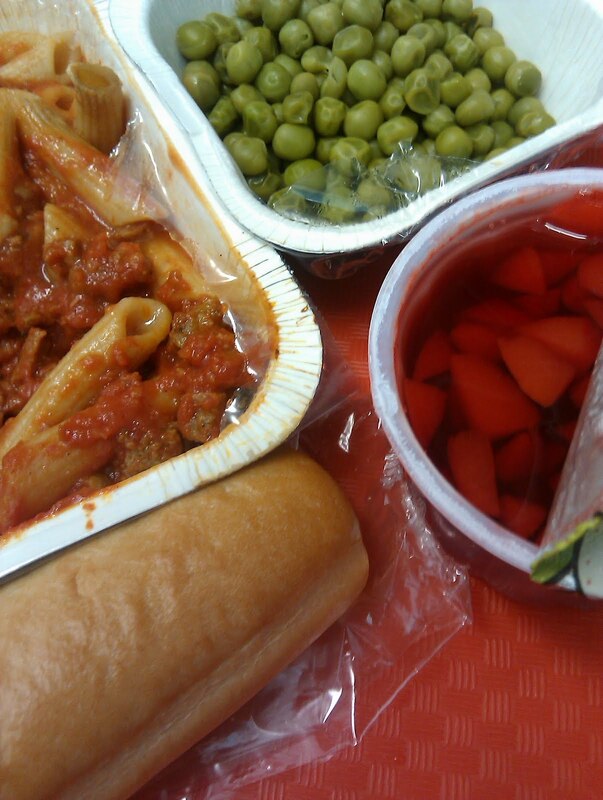 The school lunch meal pattern was foreign to me….and now I’m sucking down fruit cup juice. What happened to me? She’s right. I think 180 days a year for 12 years is inundation! Hi, I’m Dr. Susan Rubin. My journey as a school food advocate has been long and full of interesting twists and turns. I’ve been at this since my youngest child hit 2nd grade, she’s now a sophomore in college. Along the way, my advocacy work was featured in a movie, Two Angry Moms ( http://www.angrymoms.org/ )along with a cameo appearance in another one: Killer at Large (http://www.killeratlarge.com/ ) Most importantly, I worked with others to form a non-profit organization called Better School Food ( http://www.betterschoolfood.org/ ) that supports school food advocates on the grassroots level. Despite my fourteen years of advocacy, I wish I could say that that the food has significantly changed in my own school district. My youngest child is still brown bagging it and will likely continue for the remaining 5 years she’s got left in public school. How could that possibly be? Let me explain how things work. 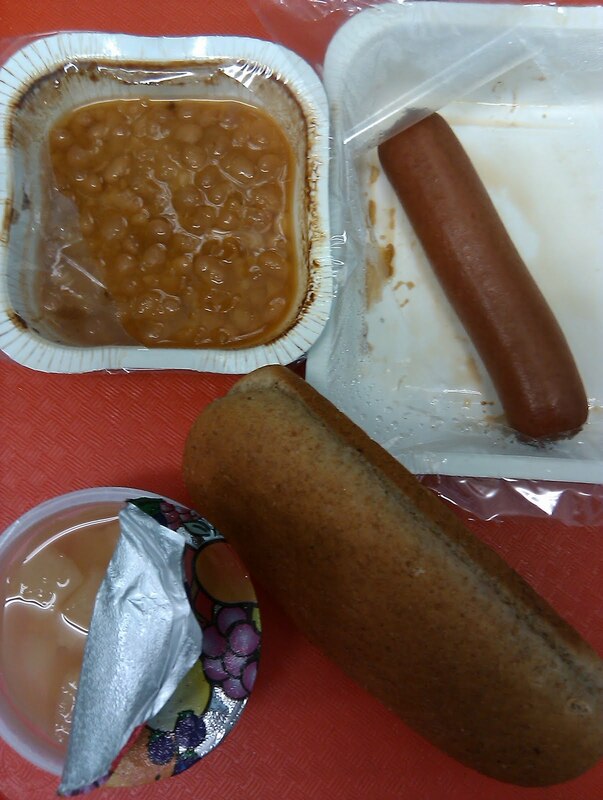 When it comes to lunch, there are two types of school food service. When advocating for better food in K-12 public schools, one of the first things you need to find out is who is running the show. Is your school’s lunch program self-operated or is it run by a food service management company? In a self-op situation, those lunch ladies you see in the cafeteria are employees of the school district just like teachers and principals are. Often times, they are members of the community and even have kids in the district. An estimated 60-75% of school lunchrooms across the country are self-operated. Chefs like Tony Geraci, Tim Cipriano and Ann Cooper are making inspiring inroads in Baltimore, New Haven and Boulder school districts where they were hired to make changes. Food consultant Kate Adamick has done wonderful things to improve school food in Santa Barbara County with S’cool Foods initiative (http://www.scoolfood.org/welcome/index.cfm ). Chefs Tony, Tim, Ann and Kate have been successful in school districts with self-operated school food service. Most importantly, they cook real food, from scratch. Other school districts, like mine, outsource lunch by hiring food service management companies (FSMCs). These corporations bring in their own employees and often make a profit by utilizing large volumes of packaged foods and snacks that qualify for rebates from the manufacturers of those products. Often, many of these snacks are the same junk that you as a school food advocate are working hard to get out of your cafeteria! Michelle Obama is aware of the impact food service management companies have on school lunch. She addressed it in her Let’s Move initiative (http://letsmove.gov/ ). As a result, three of these food giants, Aramark, Sodhexo and Chartwells, have voluntarily committed to meet the Institute of Medicine’s recommendations within five years to decrease the amount of sugar, fat and salt in school meals; increase whole grains; and double the amount of produce they serve within 10 years. Frankly, I don’t understand why more veggies in schools will take 10 years. My youngest daughter will have graduated from college by then. If we can put a man on the moon, why can’t these school food giants make a meaningful push toward better school food? And what about Farm to School (http://www.farmtoschool.org/index.php )? Why can’t these big players source some of their food from smaller, local and regional farms that are close by? It’s good for the economy and for the environment. Sadly, my school district and thousands of others continue to serve the same packaged processed food with no hope for any meaningful change anytime soon. There may be some superficial window dressing, such as “healthier” baked chicken nuggets and tater tots, Vitamin Water instead of full strength Coca Cola, whole-wheat pizza crusts with low fat cheese and some baked chips that meet new dietary guidelines. It’s easy for food manufacturers to adapt their edible foodlike products to match nutrient standards. It boils down to money. 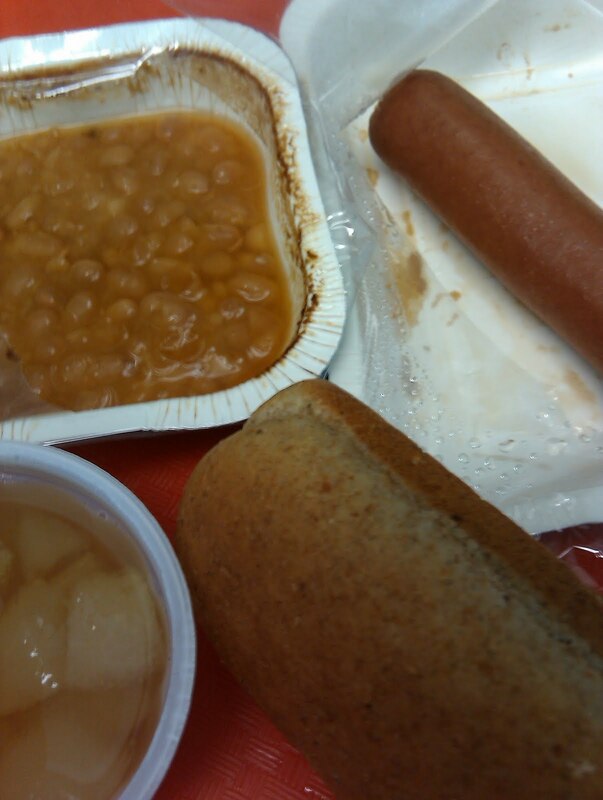 Lunch is the only part of the school day that is under the USDA. The rest of the school day falls under the Department of Education. Schools are under pressure to make sure that lunch is financially self sustaining: it must break even or turn a profit. When it comes to school lunch, our priorities are mixed up. We’ve put money and profit ahead of our children’s health and well-being. Plus, we are missing a huge opportunity to teach our kids about real food, in the cafeteria. The change will only happen when school superintendents and board of education stop abdicating their responsibilities to teach their students throughout the ENTIRE day. Kids don’t stop learning just because they’re on lunch break, and schools shouldn’t be contracting those teachable moments away to for-profit companies any more than they contract the services of the math or English departments away to for-profit companies. They are complicit in what amounts to corporate exploitation of the children in their care. What can you do as a parent to remedy this situation? Please don’t sit back, brown bag your kid’s lunch and look the other way. Take a stand and get involved. Find like minded people in your community, including teachers like Mendy Heaps and Mrs.Q, and form a better school food coalition. Visit the Better School Food (http://www.betterschoolfood.org/ ) website for more resources and email me (drsusan@betterschoolfood.org ), I’m happy to help you to come up with effective strategies that will help foster positive change. When I first started the blog project, I thought to myself, “I wish I had gotten this idea earlier because I would have started eating school lunch at the beginning of the school year…. it’s just more logical.” But even if I had gotten the idea then, late last year I was actively breastfeeding and was very careful with my diet. So it’s really a moot point. BUT now that I’m almost halfway done eating school lunches, I do believe that I couldn’t have made it if I had to go September to June without a significant break. I feel so lucky to have summer coming up and a chance to eat my own food. One cool thing about the project straddling two school years is that I’ll get to see firsthand if there are any big changes to the menu come the Fall. It’s probably wishful thinking, but I think that in September I will see changes (maybe I have to believe for my own sanity). I’d like to see more whole foods (less processed meat) and more whole fruit. I’m hopeful. Can you show the Mom-in-Chief how motivated we are to pass the Healthy, Hunger-Free Kids Act? Back in April I attended the White House Childhood Obesity Summit on behalf of the National Farm to School Network as reported here. The purpose of the summit was to gather input from experts to create a roadmap leading to children reaching adulthood at a healthy weight. Now we need to crank up the heat. Now we turn prose and a host of good ideas into actual policy. Critical questions remain: Is there legislative muscle behind this report? Will the East and West wings put their weight behind passing a strong Child Nutrition Reauthorization (CNR) this year? 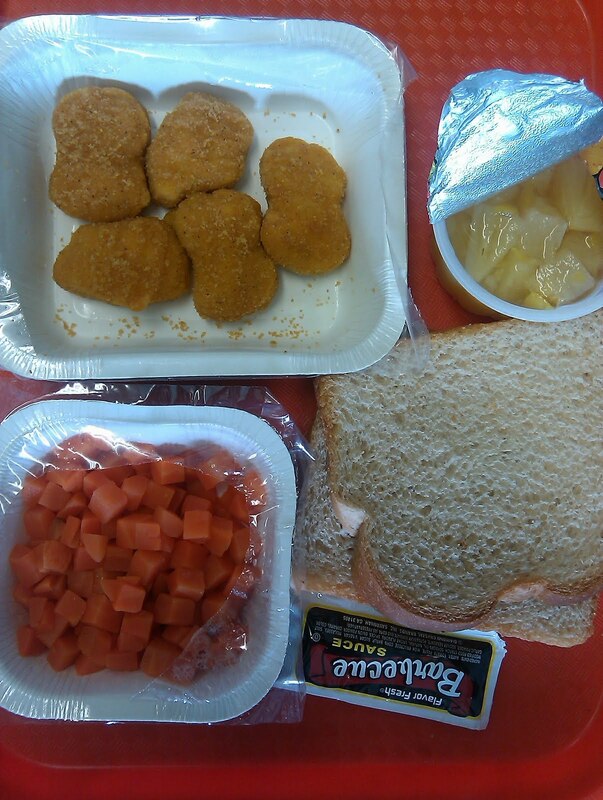 CNR is the bill that decides what’s served in your child’s lunch room and much more. Michelle Obama could test drive the new action plan now and encourage the Senate to pass the Healthy, Hunger-Free Kids Act as soon as possible. The Senate child nutrition bill has stalled and delay could mean death to our efforts thus far. Time is short; the Senate must act soon or there won’t be a child nutrition bill this year at all, and that means we lose the possibility of a small increase in reimbursement rates. It would also leave us with junk food in the school halls, scrap new funding for expanding farm to school programs, and eliminate changes enabling schools to serve free meals to all students in low income schools. Do we want more funding than the proposed $4.5 billion over ten years? Absolutely, but the only way we’re going to get the bill through Congress this year and have the chance of more dollars for child nutrition is by keeping the wheels rolling. There are opportunities lurking around every corner, but the opportunity to make significant, national policy changes that will touch the daily lives of children don’t come knocking every day. Child Nutrition Reauthorization is the opportunity to focus and unleash the motivation and willpower we’ve demonstrated through millions of signatures added to petitions, thousands of letters written by children and parents to Congress, hundreds of action alerts sent out, and even very fun spoofs such as Lunch Encounters of a Third Kind…all for the purpose of creating a healthier generation through school meals. So Michelle Obama and Taskforce, Let’s Move! and let’s do whatever it takes to get the Child Nutrition bill moving through the Senate, through the House, and into the lunch room! Help children like this 7th Grader from Georgia tell Senators to improve school lunch! I wish to commend you on your job of representing our state at the caliber that you do. Not many people are capable, or willing, to put themselves into your position. However, I feel that something is amiss at our public schools. Almost every day, I walk through the lunch line, eyeing up the different choices for my meal. Looking down at my tray, I see that each part of my meal (an entrée and two sides, accompanied by a half-pint of milk) is roughly the same shade of unappetizing brown. 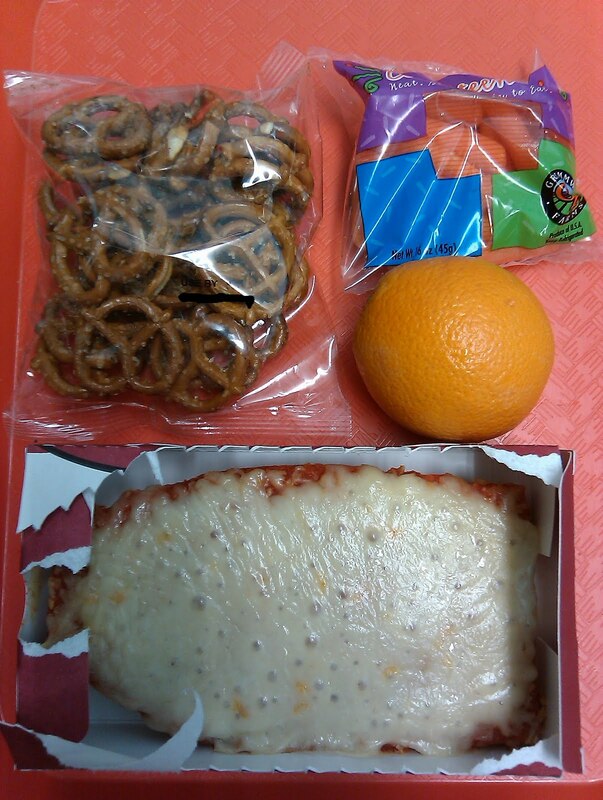 The average daily lunch consists of pizza, fries, and chips, all of which are filled with carbohydrates and salt. This produces both an un-healthy lunch, as well as an unappetizing one. 37% of children in Georgia are obese, one of the highest percentages in the nation. This high percentage of overweight children eventually leads to overweight adults, on which the future of our country rests. This obesity is a national crisis, as almost 27% of all military age men are too overweight to keep up with the strict regime of the army. I urge you to help those of us in public school obtain a healthier, not to mention better tasting, lunch. If you could help support the development of more Farm to School programs in the area, as well as advocate a change toward better food through the Child Nutrition Act, the public schools and the children within them would be better off for it. Please make your best attempt to pass this act to and to forward the progress of the Farm to School programs. Kids get it, will Congress? 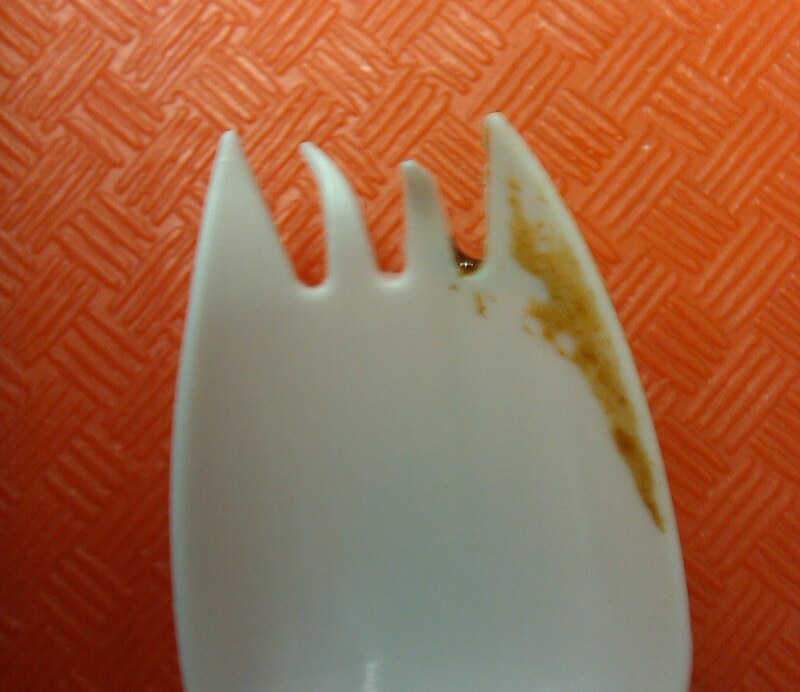 My spork was defective. You can see it is bent back and forth (reminds me of the cover of one of Augusten Burrough’s books — great writer by the way). It happened when I was tearing into my hot dog container. I tried stabbing my beans afterward and my spork just bounced off. I was desperate for beans! Luckily I was able to rip through the plastic after a little while. I ate all the fruit cup and drank the juice too. I used to just sip the fruit cup, but now I guess I’m a die hard and I eat it all. My my, how things have changed. I took a very quick informal poll with just a couple students to find out what they ate from today’s lunch. The hot dog was the only thing eaten along with chocolate milk. It appears that the beans and the fruit cup were just trashed. Really a shame. 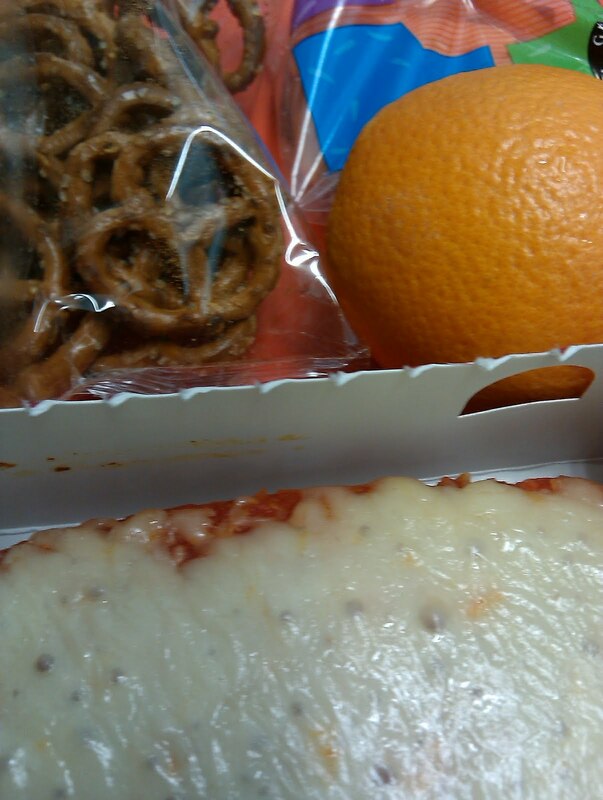 It’s fun to get kids’ comments about the lunch, but I refrain from asking the kids about their lunch every day. I don’t want to be pushy and always ask them. And like I’ve stated before they lie to me and tell me what they think I want to hear. I have been sick sporadically over the past couple months, but I haven’t kept track of how many colds we’ve had (I have young family so we do get everything). I’ve been on antibiotics once this Spring and that hadn’t happened in a long time. Facing school lunch while sick is very hard. Sometimes I just wanted soup, you know? But I push myself to get to school and not stay home so I can do my job and have the opportunity to eat school lunch for the project. It’s pretty screwed up that I’m doing that to myself. I almost melted. So sweet. Of course I asked a follow-up after thanking my student. Big eyes. Deep in thought for minutes. That question was quite the stumper! He knew it wasn’t my mother, but who? I looked around and behind myself. I walked back to my room. Confession: Teachers skip in the hallways when students aren’t there. We also yell, wave our arms and jump. Teachers even dance in the hallways when school is out. Oh you knew it all along! But I think skipping in particular is totally undervalued as a form of exercise. I also believe that sometimes our bodies propel us into moments of physical joy like me skipping at school yesterday. I let kids move around when they are in line in the hallways (well, we also don’t have recess, but that’s another story). They can move a little while I still maintain order. When I do see the (rare) kids skipping in the hallway, it just makes me smile. I love to skip and I think kids need to be skipping WAY more than they currently do. So for fun I proclaim the Friday May 28th: National Skipping Day for children and adults. Skipping is something you shouldn’t forget how to do. So I challenge children and adults to skip on Friday just once, twice, or even around the block if you are able to physically. Let’s enjoy ourselves one hopping step at a time!